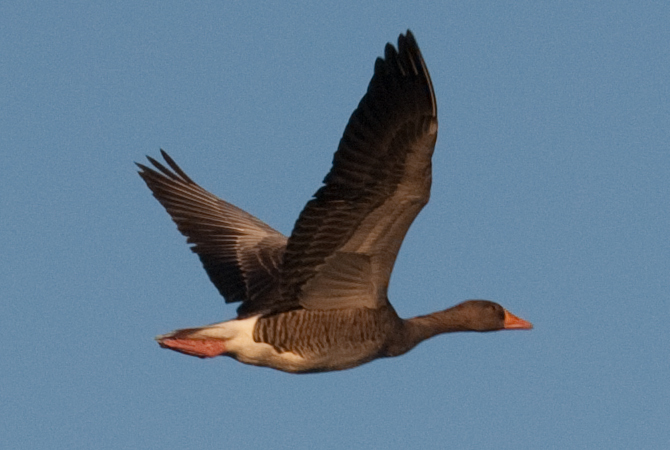 This Graylag Goose was photographed flying past a research vessel on December 3, 2010 – approximately 180 nmi east of Cape Bonavista (near position N 50, W 49d 10′). It is the second record for Newfoundland, and only the second unquestionable record for North America (since that time, one or two seemingly wild birds have been seen). Origins: Breeds across much of Europe and Asia, including Iceland. Small numbers have reportedly been nesting as close as southeast Greenland in recent years. The origins of most, if not all, other reports from North America have been questioned since this species is regularly kept in captivity. Record Details: Two records for Newfoundland – both offshore. An individual that spent several days on a vessel in late April and early May 2005 represented the first accepted record for North America. Another was photographed flying past a vessel on December 3, 2010.